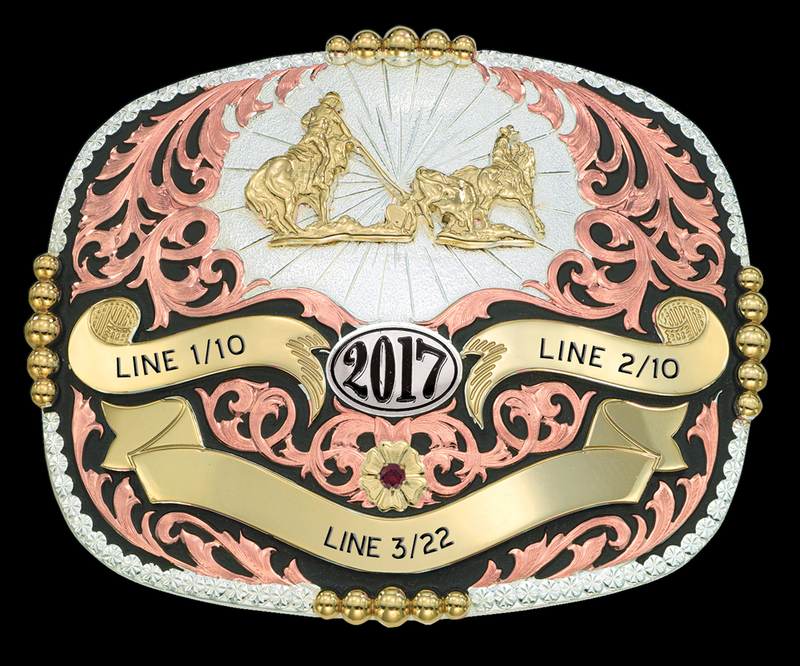 Trophy Belt Buckle from Montana Silversmiths. Select from gold ("2-Tone Finish") or copper ("3-Tone Finish") filigree buckle design. Click images to enlarge. 3 5/8" x 4 5/8". Rounded rectangular shape with graduated Jeweler's gold beads. This trophy belt buckle will be delivered with the background color of your choice - shown here in Midnight Black. Date trim and one stone (your choice of colors) is included. Enter your engraving and other options in the form below, then click >>Calculate Cost<<. This trophy belt buckle has three ribbons which may be engraved. Shown with Team Ropers figure 857 and red ruby. Features the rugged, tarnish-free MontanaArmor finish. This trophy belt buckle is also available in solid sterling silver (usually price x 3); contact us for a quote.